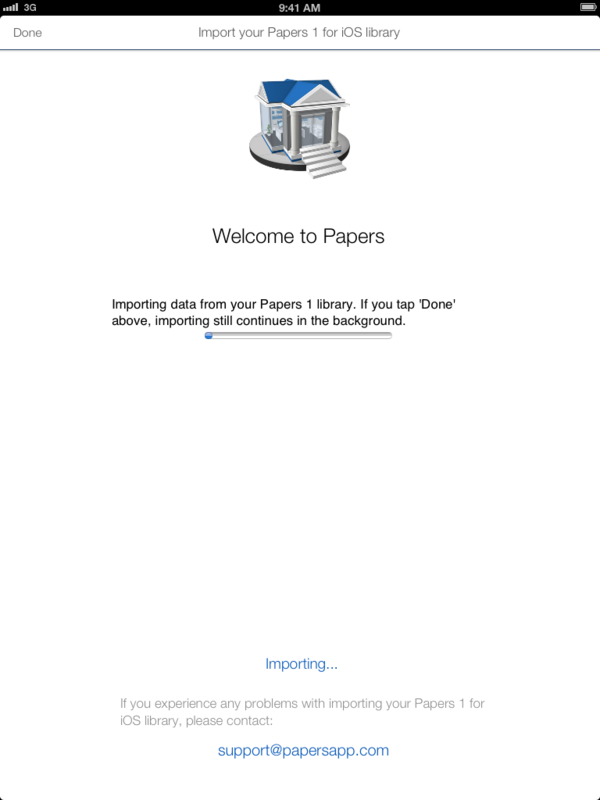 If you have a big Papers 1 for iOS library and you are struggling to import your existing iOS library to Papers 3 for iOS follow these instructions on how to import your library to Papers 3 for iOS via iTunes. Note that in order to do these steps you must be running the latest Papers1 for iOS update 1.9.20 on your iOS device. Start Papers 3 for iOS and select 'Import Papers 1 for iOS Library'. 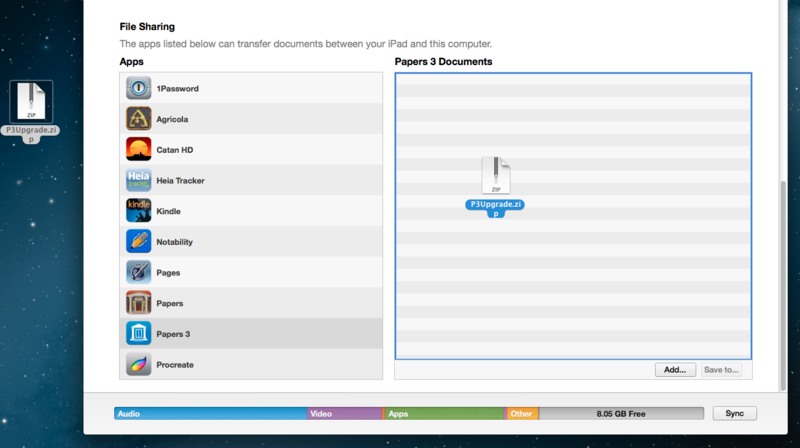 Your Papers 1 for iOS is opened with a sheet saying 'Transfer Library to Papers 3'. Wait until 'Preparing upgrade' status changes to 'Upload Progress' after which you can close Papers1. Connect your iOS device to iTunes and open the Apps tab. 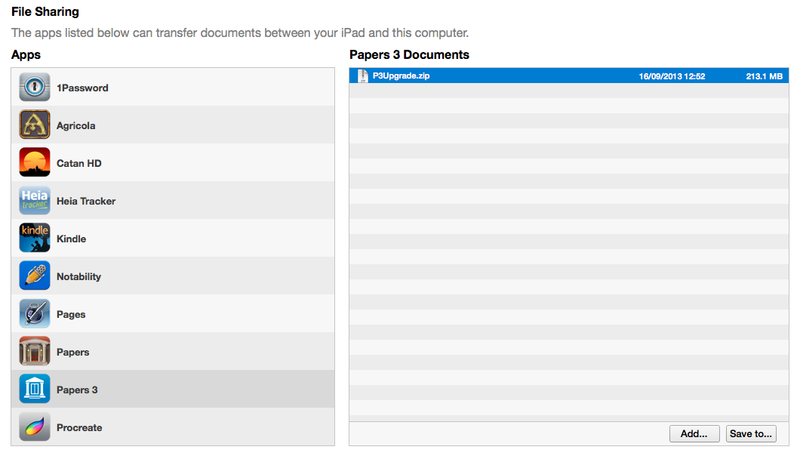 Scroll down to File Sharing and select Papers. 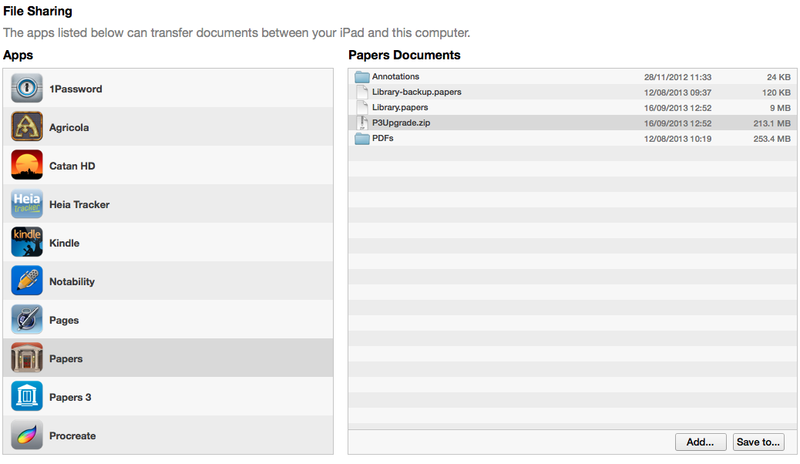 Drag a P3Upgrade.zip file from Papers Documents section to your desktop. Select Papers 3 for iOS from the Apps list and drag the P3Upgrade.zip file from your desktop back to Papers Documents section on Papers 3 for iOS. The Papers Documents section will first appear empty but if you click on any of the other apps and then return back to Papers3 the P3Upgrade.zip file will appear in the Documents section. Your Papers1 library is now ready on Papers 3 for iOS and as soon as you open it on your iOS device the Papers 1 library import will start automatically.